Price-Hero is the PUP that uses misleading techniques to prevent removal. Use Reimage to locate malicious components and get rid of them faster than with uninstall instructions. A full system scan blocks virus reappearance and prevents traffic to malicious domains. How can Price-Hero hijack my computer? How to remove Price-Hero virus? 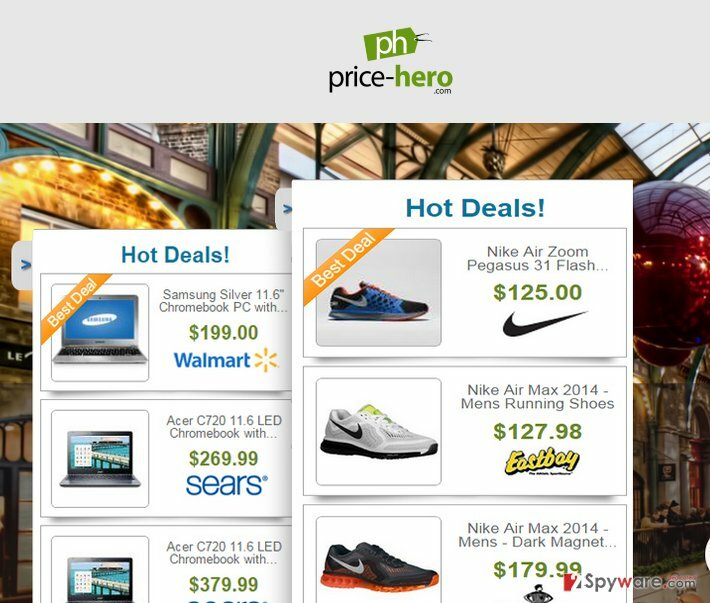 “Boost your online shopping experience!” with Price-Hero and similar notifications can be found when visiting the official website of this app or when you are installing another freeware. This app is distributed in a form of browser plug-in and promises once inside to enable comparison shopping. It is stated that Price-Hero add-on will deliver you ads containing items, services and other things related to your searches and deliver them when you are surfing thru such websites as eBay, Amazon, WaltMart and so on. Unfortunately, no matter how useful this program may seem to you, do not fall for using it because it's just another adware and a potentially unwanted program (PUP) that can hardly be reliable. Even if it claims being able to deliver the best deals that are found all over the Internet, you have to beware that 'Ads by Price-Hero' are set to deliver only the deals that are accessible at affiliate websites. In addition to that, no one can guarantee that all advertisements that this program delivers are safe. That's because it's sponsored by third-parties and seek to drive visitor's traffic to affiliate websites. Thus, since you are not hundred percent sure that its affiliates are reliable, you should never click on Price-Hero ads. In addition to that, we have already mentioned that all ads delivered by this domain are prepared according to your searches. Even though it does not seem risky for you, beware that for that all your search queries, websites visited and data entered are collected, as well as IP address, email address, PC's location and similar information. If you do not want to suffer from an excessive amount of spam and other inconveniences, we recommend you to run full system scan with Reimage or another reputable anti-spyware and get rid of Price-Hero virus as soon as possible. Here, look for Price-Hero or any other recently installed suspicious programs. Wait until you see Applications folder and look for Price-Hero or any other suspicious programs on it. Now right click on every of such entries and select Move to Trash. When in the new window, check Delete personal settings and select Reset again to complete Price-Hero removal. Once these steps are finished, Price-Hero should be removed from your Microsoft Edge browser. Here, select Price-Hero and other questionable plugins. Click Remove to delete these entries. Now you will see Reset Firefox to its default state message with Reset Firefox button. Click this button for several times and complete Price-Hero removal. Here, select Price-Hero and other malicious plugins and select trash icon to delete these entries. Click Reset to confirm this action and complete Price-Hero removal. Here, select Extensions and look for Price-Hero or other suspicious entries. Click on the Uninstall button to get rid each of them. Now you will see a detailed dialog window filled with reset options. All of those options are usually checked, but you can specify which of them you want to reset. Click the Reset button to complete Price-Hero removal process. This entry was posted on 2015-01-19 at 22:02 and is filed under Adware, Viruses. You can quickly scan the QR code with your mobile device and have Ads by Price-Hero manual removal instructions right in your pocket. How did you remove Price-Hero ads?